Rapid advances in techniques for the creation of ultra-short laser pulses promise to boost our knowledge of electron motions to an unprecedented level. Next-generation approaches to the production of ultrashort flashes of laser light – the so-called third generation of femtosecond laser pulses – are stimulating further advances in the investigation of ultrafast processes in the realm of the microcosmos. In the foreseeable future, the new techniques will permit the motions of subatomic particles to be observed in far greater detail than has been possible hitherto. In the new journal Optica, published under the auspices of the Optical Society of America, researchers led by Professor Ferenc Krausz of the Laboratory for Attosecond Physics (LAP) at the Max Planck Institute for Quantum Optics (MPQ), together with a team based at Ludwig-Maximilians Universität (LMU) in Munich describe the underlying technology and the prospects that it will open up. Techniques for the generation of pulses of laser light that last for a few femtoseconds, first demonstrated in the 1970s, have made giant strides since then. Progress really began with dye lasers that could produce pulses of less than one picosecond in duration. Soon the limits of the technique were extended, and pulses lasting for a few femtoseconds became standard (one femtosecond is a millionth of a billionth of a second, 10-15 s). A light pulse of that duration consists of only a few wave cycles, i.e. a few oscillations of the electromagnetic field. Its shape is such that the amplitude of the oscillations rises to a maximum near the middle of the pulse and then falls off again. At peak amplitude, femtosecond pulses can deliver terawatts of power (a terawatt is 1 billion or 1012 watts). In comparison, a conventional nuclear power station typically produces on the order of 1 gigawatt or 109 watt, 1000 times less than the peak output attainable with an ultrashort laser pulse. Next-generation (the third in all) femtosecond laser technology will be able to create pulses with terawatt levels of power several thousand times per second, i.e. at a frequency 100 to 1000 times higher than is now feasible. 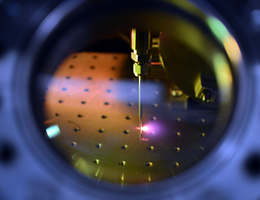 These advances are being made possible by the properties of so-called thin-disc lasers. The name refers to the shape of the light-amplifying crystal used in such a laser, which takes the form of a thin disc. Compared to conventional solid-state lasers – which employ thicker rods or slabs – this geometry ensures greater stability of operation at higher powers. The bright picosecond pulses produced by such a source are, moreover, ideally suited for use as ‘pump’ pulses for so-called optical parametric amplifiers (OPAs). OPAs convert the energy contained in the picosecond pulses into light flashes lasting for a few femtoseconds with peak power levels in the region of terawatts. Furthermore, theoretical investigations predict that third-generation femtosecond pulses will provide the means to produce next-generation attosecond light flashes (1 attosecond is a billionth of a billionth of a second, 10-18 s). These in turn can be used to study ultrafast processes at subatomic scales, in particular to capture the motions of electrons by a process analogous to flash photography. Calculations show that the wavelength of the light of which such flashes are composed should be less than 1 nanometer. In other words, the combination of techniques just described will make it possible, for the first time, to generate attosecond pulses of X-rays. Attosecond X-ray are of particular interest because they enable one – by means of X-ray diffraction – to take sharply focused snapshots of the motions of electrons within molecules and solids, fixing their positions with a resolution of less than 1 nanometer. From sequences of attosecond shots, one can, for the first time, to trace the paths followed by electrons in atomic systems, which are subject to the laws of quantum mechanics. At the Laboratory for Extreme Photonics (LEX Photonics), the new center for laser research at LMU Munich, physicists are already at work on the production of third-generation femtosecond laser pulses, which will permit the extension of attosecond pulse creation into the X-ray region of the electromagnetic spectrum. Given that many aspects of the behaviour of electrons are poorly understood, the enhanced laser technology that is now on the horizon offers us the chance to tease out further secrets of the microcosmos. Indeed, attosecond X-ray flashes might even make it possible to make movies – in real time – of all particle motions beyond the influence of atomic nuclei.